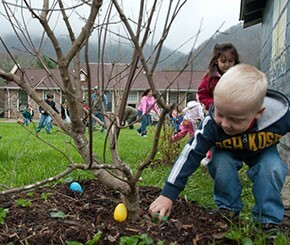 Easter Egg Hunt – The egg hunt starts promptly at 11 am, and there will be several hunts by age groups with prizes in each category. Meet the Easter Bunny, and enjoy lemonade and Easter cupcakes. Are you a deviled egg maker? Deviled egg contest entries need to be in by 11 am. Everyone tastes and there’s a $50 cash prize for Best Tasting, and prizes for Best Presentation and People’s Choice. Another fun event will be the “Peeps on the Creek” duck race. Sponsor your own duckie and help raise funds for the Stecoah Valley Center.